At the beginning of Drake’s Nice for What, a young woman states, “I keep letting you back in, how can I explain myself?” After last nights split decision draw at the Staples Center between heavyweight stalwarts Tyson Fury and Deontay Wilder, boxing fans have to be waking themselves up this Sunday with the same question. In a year filled with marquee names and bouts filled with action worthy of the hype preceding them, the unfortunate controversy of scoring a lead story yet again. After the controversial decision in the Canelo vs. GGG match, fans were again left baffled at what exactly the judges could have seen during the twelve rounds of Fury vs. Wilder. Having it happen in one of the two biggest bouts of the year is a problem. In both? Plain ugly. A three-point margin of victory sounds neither substantial or all that impressive, such is the case when you end up being knocked down twice, as Fury was during the ninth and 12th rounds. That pair of floorings are good for an automatic two-point swing in Wilder’s favor each, but it’s not enough to win the bout given Fury’s body of work throughout. The six-foot nine-inch Brit used his slight reach advantage and superior boxing ability throughout the evening to extend a doubled up jab, keeping Wilder and his unorthodox stance at bay, and giving him a swollen face because of its consistent use. 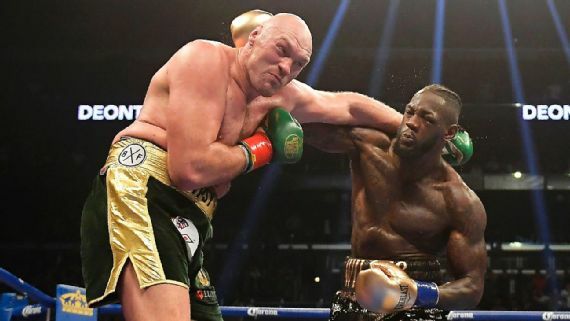 Fury also had his head movement on his side, being able to make Wilder miss over and over with just his upper body, frustrating the best American heavyweight of this decade. CompuBox figures had Wilder landing 71 of 430—17 percent—compared to Fury at 84 of 367—26 percent. Yet Wilder was never out of the fight. Despite being out landed and having the lower connect rate, anyone who hits as hard as he does is in the action as long as he’s on his feet. His momentous power displayed this with a solid knockdown in the ninth, and then with his stunning combination that sent Fury to his back and every fan to their feet in the 12th. Tyson appeared to be out of it initially. Someone who clowned on and taunted Wilder more than once during the fight was flattened and looking up. Wilder’s corner had to know that they were behind on the cards, imploring their fighter to go for broke in the final round of the evening. Then, suddenly, Fury makes it to his feet. It would appear that Wilder had used the last of his reserves getting his opponent down, but the likely round of the year was sealed the moment Tyson Fury made it back to his feet. He had done enough to win. Considering his three-year layoff following out of the ring substance abuse issues, and just a pair of tune-up fights this past June and August against much less dangerous opponents, what the former Lineal Champion pulled off was simply remarkable. Yet it was not to be. Judge Alejandro Rochin turned in a scorecard of 115-111 for Wilder. Meaning that entering the final round, he already had to have Wilder leading by two points. Judge Robert Tapper scored the bout 114-112 in favor of Fury. Judge Phil Edwards saw it as an even draw at 113-113. Three men sitting ringside somehow all saw a different fight. Not that this is anything new in boxing, but that doesn’t take the punch out of a great evening that will certainly be contested again in the near future, as both fighters and their camps indicated in the media obligations following the match. This result and likely impending rematch will make the boxing world wait even longer for the much-anticipated meeting of Wilder and another undefeated British champion, Anthony Joshua. The hype will continue to build toward their eventual showdown, and if this first match is any indication, Wilder vs. Fury II will be as entertaining as any fight 2019 will have to offer. Keeping both fighters unbeaten aids the hype machine that is sure to be rolling sometime next year, as the Joshua camp will claim that they want the eventual winner—if there is one.